When Nicole Curiel starts something, she finishes it. However, when it came to her degree, she faced a winding path on her route to education and pursuing her passion for aviation. 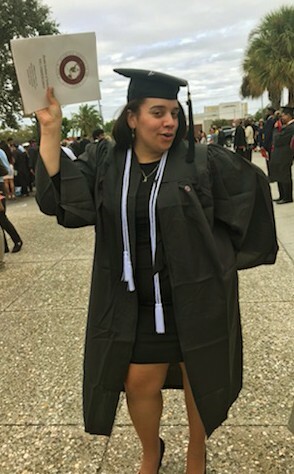 After trying community college, a non-accredited university and another private university, the single mother finally found Florida Tech’s Bachelor’s in Aviation Management. 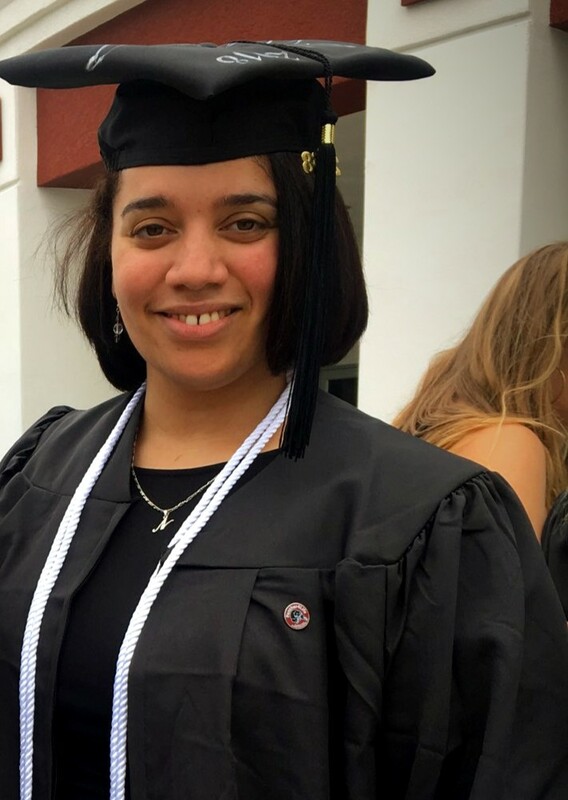 While she started her degree on campus, the Tampa Bay, FL resident decided to switch to online, providing her the ability to continue earning her degree without needing to commute over two hours to campus. Despite her previous setbacks, Curiel persisted, and graduated with honors as part of the Class of 2018. We asked Curiel about her career plans, her academic experience and more. I was born in the Dominican Republic, grew up in New York City, and have lived in numerous U.S. cities as well as in France. I have been fascinated with all aspects of aviation since I was a little girl. I got on my first airplane when I was four years old, and remember my excitement vividly. I’m looking to pursue a career in the aviation industry, be it flying, airport operations or airport design. I’m excited that my degree is in Aviation Management because I have no intention of leaving the industry. I know I will have many great experiences, particularly working in a field I am passionate about. The most challenging part of my student journey was not having proper guidance when I initially started my post-secondary studies, then transferring schools and relocating often. Before becoming a student at Florida Tech, I was enrolled at a community college in Michigan, where I was living at the time, and then transferred to a non-accredited university that racked up student loans in my name. I dropped out after finding out that the university was non-accredited, and 1.5 semesters incurred almost $30,000 in loans. I was young and naïve, but I was also a new mother. I decided I would take a break from my studies and focus on my son. Years passed, and I decided I wanted to complete my studies. I am the type of person who does not like to start something and not finish it. I enrolled in a four-year private university, but still was unsure as to what I wanted to pursue, so I continued the path of Business Management. I was scheduled to graduate in Spring of 2014, but a terrible blizzard in January of that year left my car buried for two weeks, and I had to drop out for the semester because I was too far behind. That was when I made the decision to return to Florida. In Florida, I again decided I wanted to finish my studies, and discovered the Aviation Management program through Florida Tech, a program I never knew existed. In 2015, I applied to Florida Tech, but was denied admission due to academics, and sat down with a Florida Tech advisor to see what I need to do. This was the first time I felt I was properly guided through a college process. He advised me to take a couple of semesters at the local community college to get my grades up, and then to re-apply, which I did; I was certain that Florida Tech was the school I wanted to graduate from. After a few semesters at Eastern Florida State College and an improved GPA, I was accepted into Florida Tech, where I later switched from on-campus to online, and recently graduated with honors. The most important factors in my decision to choose Florida Tech is the reputation of excellence that the university holds, the specialty in STEM fields, and the respected programs in aviation-related fields. Additionally, the high academic standards that are required are very appealing because of the challenge that it presents and the rewards that follow. My Florida Tech degree will make a world of difference in my career. Graduating from Florida Tech reflects persistent and consistent hard work, dedication and credibility due to the higher academic standards. This degree will also reflect better knowledge and understanding because of the in-depth education that I received from Florida Tech, all of which any employer can appreciate. Do you have any future plans with your degree? My future plan with this degree consists of joining the U.S. Air Force as a Commissioned Officer, where I can start a fulfilling career that is related to aviation. Becoming a pilot is the goal, but I am open to any position pertaining directly to aviation. What surprised me most about taking an online program is how much human interaction there is despite not being in a classroom setting. I initially thought that I would miss the “people” aspect of being on-campus, but soon realized that there are many opportunities to meet and interact with others, and the online classroom can be really similar to the on-campus setting. My favorite class was Airport Design. I never realized how many regulated calculations and precise measurements are in place to ensure safety on the surface and the approach/departure ends of the runway. I love mathematics, so seeing this structure made me realize the mathematical art that is Airport Design. The portfolio that we made during the term also served as a keepsake that can be referenced over time, considering the regulation and principles don’t change. The most valuable takeaway from the program is the accessibility and availability to resources, both online and on-campus. There are plenty of resources to aid in a student’s success, and the online program is efficient and effective at making students aware of this. I live over two hours from campus, and so I was able to drive over occasionally and access people or resources, but this was more by choice, not by need; the resources available online were just as accessible to those on-campus. The advice I would give to others considering the program is to “GO FOR IT!” Online learning allows for more flexibility in time, as you are able to get your studies done from home or work, and it makes a great difference when you have children or other life obligations. The Florida Tech online program, specifically, lets students learn from a regionally accredited and high-ranking university that has a high-tech, high-touch approach to online learning, where human interaction is equally important despite the online platform. My support system consists of my mother, my son, my siblings, my father, my grandparents, and a few friends that have seen me on all aspects of this journey, through different setbacks and life occurrences. What inspires me to succeed is family, first of all. I am a single mother, and I have to be the best example for my son. In order for him to have high expectations of himself, I have to show high expectations of myself, and continue to pursue improvement and excellence through hard work and dedication in all that I do. Secondly, I am inspired to lead a better life while having the ability to positively impact others through my story and my efforts. I feel the U.S. Air Force will allow me these opportunities, while also having a secure and fulfilling career. My drive for success stems from my family ties and my desire to lead, grow and improve. One fun fact about me is that I love learning languages, and I am fluent in three: French, Spanish and English. I’m currently learning German, and once I’ve reached proficiency, I am going to undertake Arabic.